because his owners felt their house was too busy with two young children. Ace went to his forever home during the Autumn of 2015 . 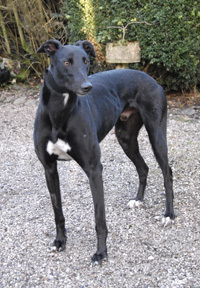 Ace is a stunning black ex-racing greyhound who was born on the 24th August 2011. He weighs 35k and had a toe removed during his racing career. He is neutered, inoculated and microchipped. Ace is a friendly lad with a nice temperament, but pulls a little on the lead until he settles, so a harness is going to be useful here until he gets used to his new surroundings. 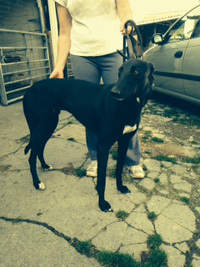 Ace was re-homed on the 7th December 2014 and was sadly returned to us on the 2nd June 2015. His owners felt he was not 100% happy with them and found living in a home with 2 young children too busy for him. Ace is a friendly lad with a nice temperament who walks lovely on the lead, suffers no separation anxiety, is fine with other breeds of dogs and travels well in the car. His previous owner said he was doing so well mixing with all types of dogs, returning when whistled or called, and walking next to him off lead in the woods. There were tears when he was brought back here and his owners dearly wished he'd been happier with them. 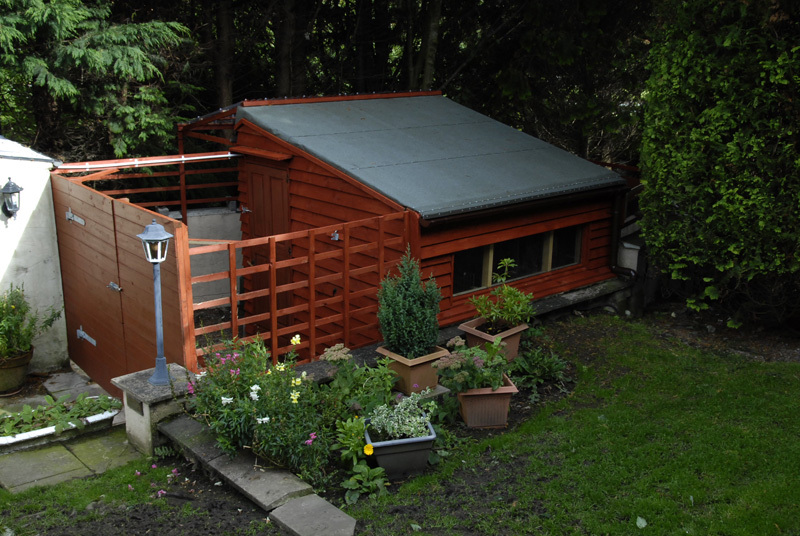 * The branch kennel at the bottom of our garden is where Ace and the other resident(s) will be for the first day or so until he gets to know the other greyhounds. He has use of our garden and paddock, and once he gets to know the other dogs he will be allowed in the house during the day and all the dogs will then take it in turn to sleep in the house at night, so they become use to sleeping in both the kennel and the house. Ace arrived this afternoon and what a stunning lad he is. We let him in the garden with our Indi and Annie who arrived a couple of days ago. We wanted these two to get to know each other as they will be sharing the kennel together each night for a while. Whilst Ace was running around the garden this afternoon he ran into the corner of the picnic bench and cut his shoulder. It's not too bad so the vets said they would deal with it on Monday when he comes in to be neutered. When Ace went to the vets this morning to be neutered he weighed in at 34.8k. While there his the cut in his shoulder was cleaned up and stitched. This lunch time the family wishing to adopt Ace arrived and took him for a walk to introduce him to their two young sons. It also helped Ace as he was a little overcome with all the attention focused on him. He looked more at ease upon his return and went in the garden for a wander before coming back inside and changing his branch collar for his new one before leaving. His new owners are aware he has a liking for remote controls and mobile phones if he is a little anxious or bored and they are laying around. They also know he was quite a 'leg cocker' when he first arrived, but now he isn't, and will go to the back door asking to go out. They are aware he may turn back into a 'leg cocker' for a little while until he settles. He walked happily out to the vehicle, but needed a little tuition on how to jump in the back with it being so high. Up inside he looked around and began to settle as they drove off. Ace is a lovely lad and we shall miss him, but he has a nice home to go to and we wish him a long and happy life with his new family. Heard today that Ace is settling into his new home very well. We received an email this afternoon letting us know Ace is settling in well. His new owners say he is such a kind natured dog and loves their boys. We received a phone call today asking if Ace could be returned into Rescue. Sadly, despite trying the advice we've been offering over the past few days, his current owners still believes he is not happy living with them and arrangements are in place to bring him back here at the end of the week. We received a call today saying sorry, but after much thought Ace's owners can't hand him back and have decided to keep him. Over the past couple of days he seems more settled and beginning to come out of his shell. They are not sure what has brought this on, but since chatting with us something they are now doing, or not doing, has helped him settle. Good news! 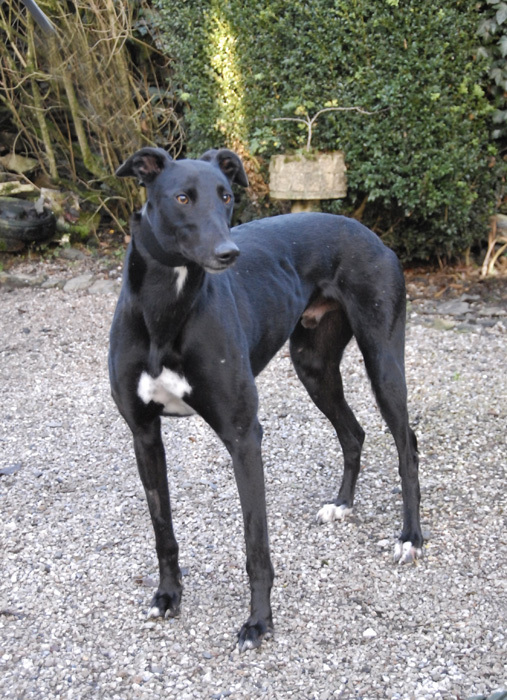 Sadly Ace was returned to us this morning. When his owner left he looked for her and then went very quiet and sad for quite a while. Ace was quite unsettled for the first few days of being back - grumbling at the other dogs as they walked past his bed and snapping at Jodi a couple of times when she ran past him. We put a muzzle on him for nearly 4 days while I could assess him and work with him. He was not happy with that, but it mean't the others could move around him safely and I could watch all the behaviour between them. He's fine now, no more muzzle, settled, comes wagging his tail to greet us, wants cuddles when I'm doing things on my computer and he seems more content being here with the others. Just so pleased he's back to being the Ace of before. Sadly when Ace nipped a second dog as she went past him, which required stitches we decided it wasn't fair on the other dogs here nor was it fair to keep him muzzled all the time while we worked on the issue. As a result, we phoned Tom Edgar at the West Cumbria branch who suggested he take him into his kennels where he could undergo a 3 month assessment period. Once that was complete they could move forward with Ace and find him the right home. After the assessment period Ace was re-homed. He is now living on a farm where he is the only dog. I've not spoken to his new owners but Tom says he is very happy where he is, can chase rabbits all day if he wishes and he is loving life.